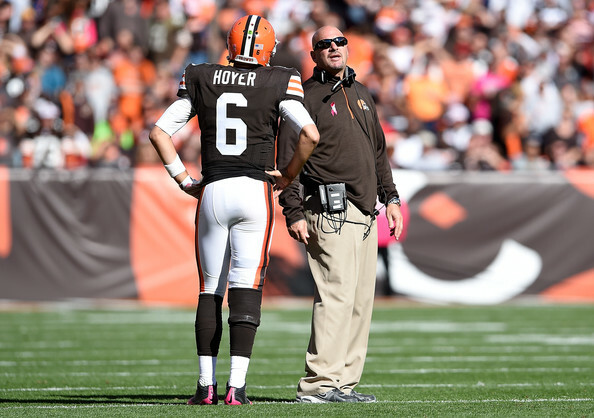 Can Brian Hoyer reward Mike Pettine’s faith in him? The Cleveland Browns return home on Sunday to face the Indianapolis Colts in the penultimate home game of the 2014 NFL season. It seems like only yesterday that quarterback Brian Hoyer was rallying the Browns in the second half of the season-opening game against Pittsburgh. Now the Browns need that Hoyer (or at least a close proximity) to show up if they hope to turn an encouraging season into a special one. By now we all know what the Browns need to do to win a game – run the ball, play decent defense, and avoid turnovers. The Browns may be able to run the ball against the Colts, who come into the game ranked 12th in the NFL and giving up 4.5 yards per carry. Of course, the Browns need running backs Terrance West and Isaiah Crowell to hold onto the ball to be effective. There is really only one story line for the game against the Colts, and that centers on Hoyer. Earlier in the week it seemed likely that Browns head coach Mike Pettine was ready to pull the plug on Hoyer and insert Johnny Manziel at quarterback. But Pettine, showing the thinking of a coach who is comfortable taking the long view, came to the correct decision that turning the offense of a team that is currently in the playoff hunt over to a rookie quarterback for 60 minutes is probably not the best idea. 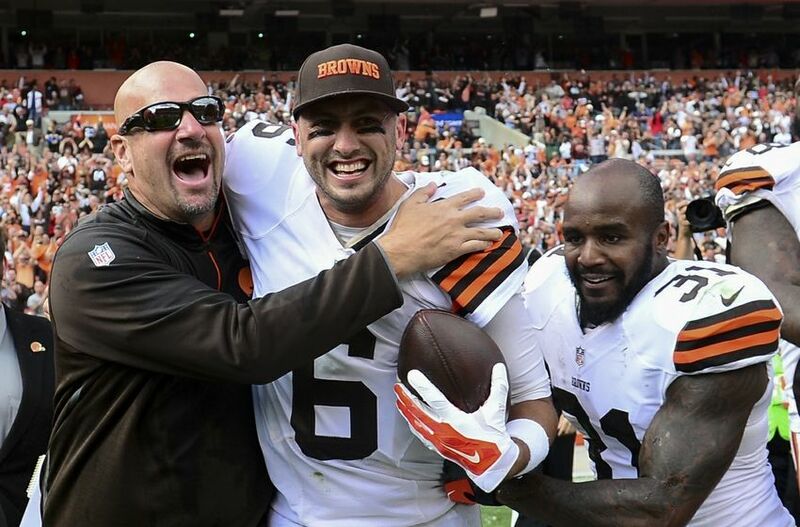 Now it rests on Hoyer’s shoulders to reward Pettine’s faith in him and erase the memory of the past few weeks of play. Hoyer doesn’t have to be spectacular over the final four games of the season; he just needs to be a decent quarterback, one that resembles the quarterback who helped the Browns win six of their first nine games. That Hoyer posted a quarterback rating of 90.4 while throwing 10 touchdown passes and just four interceptions. But over the past three games, those numbers have dropped to a 55.7 rating, one touchdown pass and six interceptions. While the focus is on Hoyer, he needs the rest of the offense to help carry the water – not only from the running backs but from the wide receivers as well. As ESPN Stats & Information highlights, Hoyer has targeted the wide receivers 41 times over the past three games and the receivers have combined for seven dropped passes – after dropping only nine through the season’s first nine games. That’s not helping the cause. Also not helping is that the Browns will be without wide receiver Miles Austin, who’s 19 receptions on third down lead the team, and may yet again be without tight end Jordan Cameron, who hasn’t played since suffering a concussion against Oakland. Those losses might not hurt as much if Josh Gordon was back to being Josh Gordon, but that hasn’t been the case, especially against Buffalo when Gordon ran the wrong route, resulting in one of Hoyer’s two interceptions. This could be the week, though, that Gordon breaks out a big game. (If we keep writing that every week we’ll eventually be proven true.) The Colts will be playing without their top cornerback in Vontae Davis, and they have given up an average of 30.2 points in their five road games. The Browns have also not lost two games in a row all season and, lost in all the quarterback talk, have still won six of their past nine. Hoyer has also been better at home this season than he has been on the road, something that the home “fans” will hopefully remember during the game. The Browns have not won a game in the month of December in just under two years and in this season where they have done so much to change the perception of the “same old Browns,” that is yet another mark they need to take care of. If Hoyer can erase the memories of the past five weeks, then the Browns have a real chance to have the season-ending game in Baltimore mean something. We hate to say everything falls on Hoyer. But in this case, it kind of does.